Rebuilt in 1981, the Nanguan Mosque occupies an area of 2,074 square meters and has two floors. The Nanguan Mosque, located in the southeast of Yinchuan, is one of the largest mosques in the Ningxia Hui Autonomous Region and the biggest one in Yinchuan. Rebuilt in 1981, it occupies an area of 2,074 square meters and has two floors. During every local festival, thousands of Muslims worship here. The upper floor has a spacious prayer hall and a balcony and the ground floor has a shower room, small prayer hall, women's prayer hall, Arabic language school, offices and reception room. As one of the most important attractions, it has attracted many dignitaries around the world. 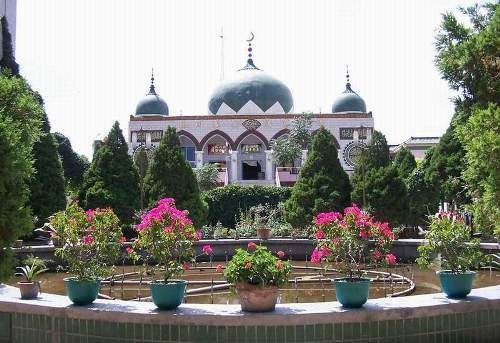 Nanguan Mosque has a distinct Islamic architectural style characterized by grand domes, arched doors and windows. There are five green domes on the top of this building. The spacious prayer hall on the second floor can accommodate over 1,300 worshipers at a time. There is a fountain in front of the spacious prayer hall, featuring a leaping display of water.